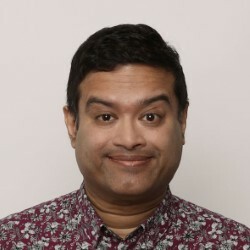 For many I suppose Paul Sinha is best known as the Sinner Man, one of the Chasers in ITV’s quiz show the Chase, yet although he is very knowledgeable , ranked the number 5 quizzer in the UK, this former GP has always been a great stand-up comedian as well. As one can always expect with Sinha the hour is delightfully written, packed out with stories, jokes misdirection and call-backs and there is no posturing or strutting, just an erudite comic, who knows what he is doing…and then some. The title of the show is an intentional misquote from Shakespeare, and boils down to age one man being on the rise and age two being downhill slope of life, and Sinha considers he is part of the latter, because of his age surely, certainly not his comedic abilities. He mixes stories of quizzing, his earlier life as a medical student, TV offers, family, relationships and medical issues, each section blending into the next with consummate skill, eliciting unexpected punchlines, witty quips and clever comparisons, more often than not in a tongue in cheek or self-deprecating manner. The time just flies by, I couldn’t believe I had been in the packed out venue for an hour when it was all over.